I accept a stay of 2 days if it fits in the schedule (please mail me direct) .I ask people to be quiet to the neighbours. The quiet comfortable apartment is situated on the ground floor of an 18th century monumental building in the Jordaan district. The area is famous for history, trendy shopping, bars and restaurants. And is situated in the city centre of Amsterdam. Apartment is located 50 metres from Prinsengracht, hundred metres from Noordermarkt, 500 metres from Anne Frankhouse with free view on Violettenstraat. Twice a week there is a local market (Monday: flee market and on Saturdays a farmer market). 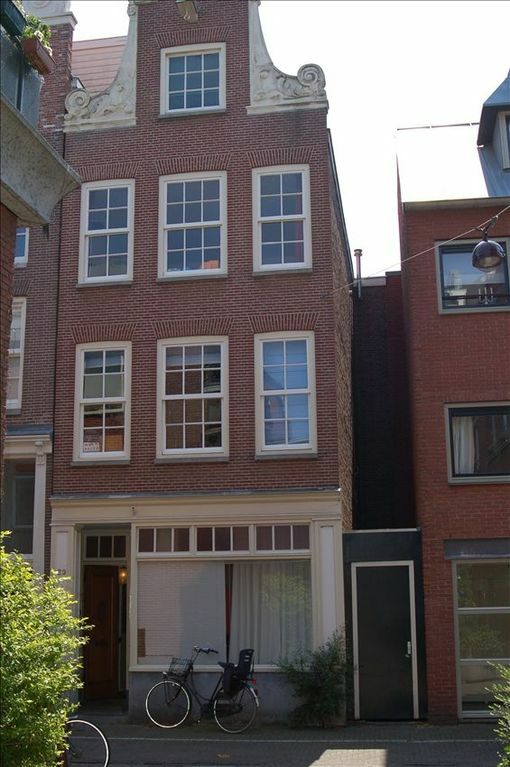 The apartment borders the canal district, is close to the Ann Frank House and nearby all other sight-seeing attractions in town (5- 20 minutes walk). The apartment is well furnished in an understated fashion. The apartment is 110 sq m (about 1050 sq ft). Renovated kitchen and bathroom (end 2012). The living/dining room has a superb view in front and a patio at the rear. The sofa also serves as two/three separate(quest) beds. There is a cable TV and stereo with CD-player. There is a computer with wi-fi. The kitchen has an oven, coffee-maker, dishwasher and microwave. The very quiet bedroom is at the rear and behind this bedroom there is a large bathroom with toilet/bath and separate shower. The bedroom has a double (not separable) bed of 2.00-2.00. It is very quiet and has open doors to the patio. Childbed available. There are three bikes available. I'm living here now for almost 30 years. I saw this area rising to the nicest area in Amsterdam. I live here now with my family upstairs. The plan is in the future to live at the basement as well. It is a beautifull place with a beautifull patio. I put a new bathroom and kitchen in it at the end of 2012 because of two reviews. Because I'm living upstairs I don't want any complaints. It is still a quiet apartment in the middle of the centre. For me it is the best neighbourhood of Amsterdam. You can walk/cycle to every part in the centre within 10-15 minutes. Lot of restaurants and bars. Markets and good shops. Within 10 minutes in a park. In fact everything is available. There is a big bath and a seperate shower. There is a mobile phone you can use during your stay. Central heating system with heating in all rooms. Between the kitchen and the bedroom there is a patio. You have to take one step at the frontdoor. There is a pool at 500 metres. Excellent, convenient location. Paul was gracious enough to buy food we needed, sunce we were arriving very late. The furnishings änd building are not elegant, just basic, but adequate -considering the reasonable price. We feel as though the apartment could have been cleaner than it was, but on the other hand it is a challenge to maintain a building as old as this one is. We would stay there again, if we had the opportunity. The apartment was really well located for my business meetings in Dam Square (10 minute walk). Large amount of space in the living area was more than adequate for one person. The bedroom could do with painting but apart from a couple of cracks and cobwebs around the windows was acceptable. The bathroom really needs some renovation with peeling paint, damp spots on the ceiling and caulk in the shower going moldy. Maybe too much to handle for some. Slight delay in getting access but Paul was quick to resolve this and his designate Wendy was very friendly. Great location with good price. Spacious apartment, comfortable for 5 persons. Apartment standard is adequate to price. Very close to grocery store. Beautiful property, Paul was lovely, very close to everything! Thank you so much for letting us stay, it was great to see the sights and have somewhere comfortable to come back to when we wanted. Thanks for staying and your beautiful review. Paul’s apartment is located in the Jordaan area which makes it very central, close to shops and restaurants and a lovely area to visit. The Monday and Saturday markets and laundromat are closeby. The building is quite old and seems to need some structural work. The floor had been freshly mopped when we arrived but we felt a bit more comfortable after we went around with the vacuum, dusted and had to re-wash some of the crockery/cutlery before using. We appreciated Paul’s hospitality and fast communication. The apartment was good value for money because of its location and size. Very run down place. On the positive side, it is big and central. The place is very run down. The toilet is poorly installed and seems it will fall at any time. You can feel water running under the tile. The place is full of unnecessary stuff, no soap at the shower though. We choose if because it was big (110m2) and very central. That much is true but the property should not be advertised as adequate for lodging. The owner is kind but should at least wear shoes to receive its guests. It is strange to have 2 reviews within 2 weeks with such a difference. I let two people in who where 2 hours late so I had no shoes on. Real older people who didn't speak a couple of words. I explained them everything, installed wifi on telephone etc. The son and family game the next day. Because I was so friendly to explain everything and helped the older people they promised me a wonderfull review. I think because of the jetlag the only kid was running around at 4.00 for 2 days without a warning of parents because it went on. Complaining about soap which was in the cupboard is a bit strange I guess. They left without saying goodbye leaving the heather on 24 C.
Everything is possible in the surroundings of Amsterdam. I advice when you have a longer stay to find your way on internet. If you have a stay shorter than 7 days you will have a very busy program just in the surroundings (within 5 miles). There are 3 bikes included so you can bike all around. Two days are possible but price will depend on availability. Rates can be less during low season or last minute. Rates are inclusive. I advice you to send a mail for the best rate. Sometimes they are lower than online. Rates depends on availability, season, last minute and how it fits in booking schedule.